Biography - Caspar David Friedrich | Since 1774. In Greifswald. Caspar David Friedrich is born in Greifswald on 5 September as the sixth of ten children to his parents Adolf Gottlieb Friedrich, a soap boiler and candle-maker, and his wife Sophie Dorothea. His mother dies in 1781, when Friedrich is only 7 years old. Friedrich’s brother Johann Christoffer drowns when trying to rescue Caspar David, who had himself fallen through the ice when skating on a frozen moat. This childhood trauma has a lasting impact on the artist’s life. Friedrich receives drawing lessons from Johann Gottfried Quistorp, University Master Builder and drawing instructor at the University of Greifswald. In 1794, Quistorp also finds him a study place at the Royal Danish Academy of Fine Arts in Copenhagen, which is known as the most progressive academy in Europe at that time. Until 1796, Friedrich first attends freehand drawing classes and then plaster and sculpture lessons. His instructors are some of the best Danish painters of their time: the landscape painter Christian August Lorentzen, the portrait and landscape painter Jens Juel as well as the history painter Nicolai Abildgaard. However, painting is not taught as a subject at the Copenhagen Academy, which is why there are no known oil paintings by Friedrich until 1797. Friedrich moves to Dresden and enrols at the local Art Academy in October. At that time, he earns his living by painting prospects, influenced by the Dresden painters Johann Christian Klengel and Adrian Zingg. For the first time, Friedrich’s work is shown at the annual exhibition of the Dresden Art Academy. In spring, Friedrich travels back home. In March and April, he first spends some time in Neubrandenburg and from May onwards he stays in Greifswald and meets up with Philipp Otto Runge. In June and August, he embarks on hiking tours on the Isle of Rügen. In May, Friedrich travels to Rügen once again. At the end of July, Friedrich and his friend Friedrich August von Klinkowström travel to Dresden, where they start sharing a flat. Friedrich paints many Rügen impressions this year. Philipp Otto Runge buys some of Friedrich’s Rügen paintings for his brother Daniel to sell at the Leipzig Fair. Friedrich moves to a summer apartment in Loschwitz near Dresden. His sepia drawings are shown at the Academy’s exhibition. Friedruch starts his first hiking tour to North Bohemia. 25 August: Caspar David Friedrich submits two of his sepia drawings and is awarded half of the art prize by the Weimar Art Society (Weimarer Kunstfreunde) despite the fact that he did not adhere to the competition task set by Goethe and Heinrich Meyer. Mecklenburg is occupied by Napoleonic troops and remains under French rule until 1813, which leads Friedrich to establish contact with a group of patriots, amongst others Heinrich von Kleist. In May, Friedrich travels to Neubrandenburg. There are distant family ties between the Neubrandenburg part of his family and Philipp Otto Runge, as Friedrich’s brother Adolf (1801) and Runge’s brother Karl (1804) both married into the family Brückner. At the end of June, he spends some time in Greifswald. In summer he embarks on another hiking tour of Rügen, before returning to Dresden in August, where he makes the acquaintance of natural scientist and philosopher Gotthilf Heinrich Schubert. Because of the occupation of Pomerania and Dresden by the then despised French troops, Friedrich refrains from travelling home in the summer but sets out on hiking tours in North Bohemia in August and September instead. Friedrich increasingly turns to painting in oil. At Christmas, Friedrich presents his first oil painting “Cross in the Mountains” (The Tetschen Altar, Galerie Neuer Meister, Dresden) in his flat, which is received with both enthusiasm and fierce objection. The public criticism by the Prussian chamberlain Friedrich Wilhelm Basilius von Ramdohr lands him in the headlines. There erupts what became later known as the ‘Ramdohr dispute’, triggering a fundamental debate about Romantic art. Some of Friedrich’s friends, including the painter Gerhard von Kügelgen, advocate the painting. Friedrich makes friends with Heinrich von Kleist and the painter Georg Friedrich Kersting. In April, Friedrich travels to Neubrandenburg and spends some time in his native town Greifswald in the coming months. His father, Adolf Gottlieb, dies on 6 November. In July, Friedrich and his fellow Mecklenburg painter, Georg Friedrich Kersting, go on a hiking tour in the mountains of the Riesengebirge (Giant Mountains). In addition, Friedrich becomes an external member of the Royal Academy of Arts in Berlin. On 18 September, Goethe visits Caspar David Friedrich in his studio. Friedrich also makes the acquaintance of Johanna Schopenhauer. In autumn, his two paintings ‘The Monk by the Sea’ (1808/10, Alte Nationalgalerie, Berlin) and ‘The Abbey in the Oakwood’ (1809/10, Alte Nationalgalerie, Berlin) are shown at the Berlin Academy exhibition. Both works are purchased by the Prussian Crown Prince and are exhibited at the Alte Nationalgalerie, Berlin today. Friedrich has reached the height of his career as an artist. His economic and social situation improves significantly. In June, Friedrich sets out on a walking tour through the Harz Mountains together with the sculptor Gottlieb Christian Kühn. In July, he visits Goethe in Jena and paints ‘Morning in the Riesengebirge’ (Alte Nationalgalerie, Berlin), which is purchased by King Frederick William III of Prussia in 1812. Dresden is occupied by French troops, which is why Friedrich retreats to the Elbe Sandstone Mountains and moves into a flat in Krippen. He regularly meets with Ernst Moritz Arndt in Dresden, whose hostility towards the occupiers he shares, as can be seen in the painting ‘Old Heroes’ Graves’ (Kunsthalle Hamburg). In March, Klinkowström visits Friedrich in Dresden. They go on a hiking tour of Saxon Switzerland. It is the last time they meet. At the Patriotic Art Exhibition organised by the Russian governor to celebrate the liberation of Dresden, Friedrich’s paintings ‘Hermannsgrab’ and ‘Chasseur in the Forest’ are two of the main attractions. Friedrich travels to Western Pomerania in mid-July and stays on the Isle of Rügen until mid-August. In September, he visits St Mary’s Church in Greifswald, not least in order to start negotiations about a draft for the construction of an altar. However, the City Council rejects Friedrich’s draft. He returns to Dresden in October. Friedrich becomes a member of the Royal Academy of Arts in Dresden and is paid a regular salary. Friedrich meets the physician and painter Carl Gustav Carus, who discusses Friedrich’s works in his ‘Nine Letters on Landscape Painting’. Friedrich submits drafts for the design of the interior of St Mary’s church in Stralsund, which are, however, rejected by the City Council. On 21 January 1818, he marries Dresden-born Caroline Bommer, almost 20 years his junior, who appears in many of his paintings with her back turned to the viewer. Together with his wife, he travels to Greifswald, Wolgast, Stralsund and to the Isle of Rügen. In autumn, Friedrich makes the acquaintance of the Norwegian landscape painter Johan Christian Dahl, who settles in Dresden. The Karlsbad Decrees are issued. Friedrich expresses his liberal convictions in some of his works by showing men wearing the banned traditional German patriotic costumes (‘Two Men Contemplating the Moon’, Galerie Neue Meister, Dresden). His painting ‘Hutten's Grave’(Klassik Stiftung Weimar), which he paints a few years later (1823/24), is a political avowal. Prince Christian Frederik of Denmark visits Friedrich in Dresden. His daughter Emma is born on 30 August. Friedrich’s friend, the painter Gerhard von Kügelgen, is murdered. In response, Friedrich paints ‘Kügelgen’s Grave’ (1821/22). The family moves to a bigger flat in the house ‘An der Elbe’ no. 33. Visit by the Russian Grand Duke Nikolay Pavlovich, who later becomes Tsar Nicholas I, and Vasily Andreyevich Zhukovsky, Russian poet and state council member. They acquire some of Friedrich’s works for the Russian Court in St Petersburg. Vasily Zhukovsky visits again and procures paintings on behalf of the Tsar. Zhukovsky’s collection helps to make Friedrich's work known also among artists in Moscow and St. Petersburg. Visit by the poet Friedrich de la Motte Fouqué. Friedrich paints ‘Moonrise over the Sea’ and ‘The Lone Tree’ (both Alte Nationalgalerie, Berlin). Johan Christian Dahl, a lifelong friend, moves into an apartment in the same house (‘An der Elbe’ No. 33) in which Friedrich is living. His second daughter, Agnes Adelheid, is born on 2 September. Friedrich is appointed Professor of the Royal Dresden Art Academy; he is not, however, put in charge of the landscape painting class, despite the fact the teaching position is vacant at that time. On 23 December his son is born, whom he names Gustav Adolf, after the Swedish King. Friedrich falls ill. He also paints ‘The Sea of Ice’ (‘The Failed Hope’, Hamburger Kunsthalle). Friedrich’s health deteriorates. He paints ‘Cemetery at Dusk’. His painting ‘The Watzmann’ is shown at the Dresden Academy. On 22 May, Friedrich travels to Rügen to recuperate. It turns out to be his last visit to the region. At the first exhibition of the Hamburg Art Association, he is represented with three of his works, including ‘The Sea of Ice’. 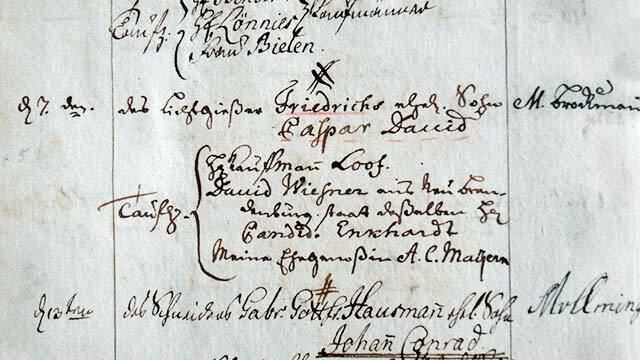 Friedrich becomes a member of the newly founded Saxon Art Association. In May, he travels to the health resort of Teplitz (Bohemia). Crown Prince Frederick William of Prussia visits Friedrich in his studio. The painting ‘The large enclosure near Dresden‘ (Galerie Neue Meister, Dresden) is shown at the Dresden Academy and purchased by the Saxon Art Association. Nine of Friedrich’s works are shown at the Third Art and Trade Exhibition in Königsberg. Yet his fame as an artist starts to wane with the dawning of Realism, a new epoch in art, which replaces Romanticism in painting. On 7 November, the French sculptor David d’ Angers visits Friedrich in Dresden: ‘Friedrich! The only landscape painter so far to succeed in stirring up all the forces of my soul, the painter who has created a new genre: the tragedy of the landscape.’ The painting ‘The Stages of Life’ (Museum of Fine Arts, Leipzig) depicts Friedrich as an old man, seen from behind, together with members of different generations of his family. On 26 June, Friedrich suffers a stroke, leaving his right hand paralysed. In mid-August/late September, he once again undergoes treatment at the health resort of Teplitz, financed by selling a number of paintings to the Russian Tsar. Friedrich can initially resume his work, but painting in oil remains difficult. He prefers watercolours and the sepia technique. Friedrich suffers a second stroke, leaving him almost completely paralysed. He never returns to painting. On 23 June, Friedrich‘s brother Adolf dies in Greifswald. A few months before Friedrich’s death, Zhukovsky helps him sell several of his works to Russia. He dies on 7 May and is buried at the Trinity Cemetery in Dresden-Johannstadt on 10 May.